Some of the childish things I put away when I became an adult were the songs I sang as a little girl. But lately they’ve been on my mind. And I realize that, although many were of questionable value, some—like “Jesus Loves Me” and “Trust and Obey”—were pearls of great price. When I was young, church education was Sunday School with double capitals. Our class was not called “threes and fours” or even “pre-schoolers” since that was long before the word or even the concept of “pre-school” came into use. I wriggled with other little children on small wooden chairs, in a room that shimmered with diffused morning light and hummed with suffused infantile energy, singing ditties like “Jesus Bids Us Shine”; “Behold, Behold!”; “Happy All the Time”; and treasured favorites like “The B-I-B-L-E” and “Jesus Loves Me.” Action songs from one of the “Singspiration” volumes (with covers featuring wide-mouthed young singers dressed in 40s fashions) were popular since they allowed us to rambunctiously move muscles stiff from being reluctantly still during a long church service. Understandably, such songs were limitedly implemented. Reviewing the lyrics from those childhood songs, I recognize and finally appreciate that some convey biblical truths of genuine value. But I also wonder how some came to be taught in the Sunday school of a Reformed church. Some may convey a wrong perception of Reformed belief and some seem to lack a Reformed basis. I’m sure that E. O. Excell, the song’s composer, intended to stress that we are Matthew 5’s “light of the world” and must exhibit the love of Christ in whatever position God places us. Even children can shine in their small corners by living for Jesus. But the song brings to my mind a different and vivid image: A child cowers on the corner of a wooden floor, a trembling finger hooked in the circular handle of a pewter chamberstick. Its flickering candle weakly bathes the scene in a feeble pool of light. Far across the dark expanse of a large room filled with frightening shadows, another solitary child hunkers in a corner under the pale illumination of his candle. Hardly an image that inspires evangelism or ecumenicity! Other children’s songs I once sang with youthful zest seem to reflect an Arminian theology. “Behold, Behold!” serves as an example, seeming to imply that it’s all up to the child to open the door of his or her heart to Christ. Mrs. N. R. Schaper arranged the words of Revelation 3:20 into “Behold, Behold!” with Jesus as an unnamed narrator who stands at the door to “knock, knock, knock.” Admirably based on Scripture, the lyrics are nearly identical to Christ’s words to the lukewarm Laodicean believers, whom He is about to spew out of His mouth in disgust. But removing the words utterly from context changes the implication from repentance to regeneration. The song seems to depict an impotent Christ knocking at the door of every little child’s heart, helplessly waiting for someone—anyone—to hear His voice and “open, open, open” the door so He can come in. Still other childhood songs have a Charismatic bent. “Happy All the Time”? Even my three-year-old brain recognized the fallacy of that song title. I certainly wasn’t happy all the time. I wasn’t very happy with myself when I pretended not to hear my mother calling me to come in while I kept playing in the sandbox. And I definitely wasn’t happy with my older brother and sister when they grabbed the drumsticks before the Sunday plate of fried chicken came around to my end of the table, or when they walked down our gravel road to play with the neighbor boys without me, or especially when they splashed water out of the stock tank to completely drench me. Total depravity and original sin were ingrained into my consciousness long before I began to understand the five points of Calvinism. The lyrics to other childhood songs stand up well from my adult Reformed perspective. Teaching little children that the only foundation for life is the Word of God and that they should stand fast on it alone is highly commendable. More adults should hark back to the lyrics of “The B-I-B-L-E” and embrace that simple philosophy in the face of the myriad of modern ideologies that set themselves up in opposition to God’s Word. The point I believe Dr. Sproul wants to make is that the greater our degree of interest in something, the more we want to learn about it. And we should all want to learn more about theology, which is—after all—the study of God. Hebrews 5 encourages believers to grow beyond the “milk” of God’s basic principles to desire “solid food,” which is for “the mature, for those who have their powers of discernment trained by constant practice to distinguish good from evil” (verses 12-14). 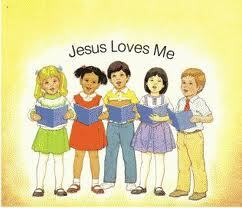 Still, I understand that the song title, “Jesus Loves Me,” reflects the most basic Christian truth. The only way of salvation is through Jesus Christ and His sacrificial atonement, made out of His great love for sinners like me. I am God’s enemy unless Jesus loves me enough to die for my sins. The title alone of that song conveys a world of meaning: “Jesus Loves Me,” indeed! Written by Anna L. Warner, the lyrics poignantly encapsulate the gospel message: I know that Jesus loves me because “the Bible tells me so.” Little ones belong to Him, and even though they are weak He is strong. Jesus died to open the gate to heaven, wash away my sin, and allow His children to enter. Jesus loves and watches over me even when I’m weak and ill. Jesus loves me and will stay “close beside” me “all the way” of my life, and—if I love Him—He will take me home to glory. “Jesus Loves Me” is profound in its simplicity. I learned that song during my early school years, when elementary school was still called grade school. My chair connected by a bottom bar to a desk with a top the lifted like a lid, behind which I sometimes surreptitiously read “Bobbsey Twins” books. Windows figure prominently in my school memories: the snow swirling outside them or the metallic tapping of the flagpole chain in the spring breeze that wafted through them. Our classes sang from the Let Youth Praise Him! songbook (whose title appeared in a cloud-shaped blue balloon on its maroon cover). Even at that young age, I understood the song’s call to trust God and obey His commandments. And life has a way of deepening one’s understanding of things. God uses trials and suffering to purify our faith in His refining fire. A traumatic moment of my childhood occurred during the annual Mission Fest held in West Market Park. The park was transformed from its empty expanse of grass, bordered on the south with a solitary shelter and on the north with a playground, to a teeming mass of humanity in lawn chairs listening to missionaries from far-flung countries tell of evangelistic exploits. Refreshments were available from a temporary canteen set up in the corner of the park. With my dime, I invariably purchased a box of Cracker Jack (A Prize in Every Box!). While adults listened to speakers or sang “From Greenland’s Icy Mountains,” children ran free or played on the equipment. 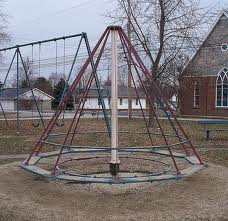 The playground featured a contraption locally dubbed the “witch’s hat” that consisted of planks fastened together in a circle suspended by heavy metal cables from a center pole. Children sat with their legs between the wood and a protective bar that clanged with deep resonance against the center pole as the base slowly swung back and forth and around and around. Woe to that unfortunate child whose fingers, clutched to the bar in front of her, didn’t release quickly enough when the bar thumped against the pole! The playground also contained swings, monkey bars, and slides. One slide was perfectly normal, but the other was a two-humped monstrosity that seemed to tower nearly as tall as the ancient maple beside it. It was for big kids. 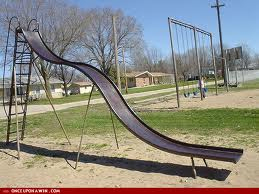 I sailed down the slide and launched into space, landing flat on my back in the dirt. At the time, I didn’t know that what had happened to me was euphemistically called, “getting the wind knocked out” of me. I only knew that I was dying. I don’t recall when I was able to breathe again or how long I remained flat on the hard ground. I don’t remember getting up, but I do remember slowly stumbling through a sea of pale faces in the deepening darkness, trying to find the white disk that was my mother. Trauma and tragedy knock the wind out of us. We lie on our backs, overwhelmed by our total helplessness. We long for the comfort and security of a mother’s arms. But our Heavenly Father sustains us through life’s trials with a comfort and security that surpasses that of any earthly mother. He uses the trials of our lives to shape our simple child-like faith into a robust mature faith. He teaches us to “Trust and Obey.” The older I get, the more I realize the nature of total dependence upon God—the trust part—and the more I learn about submitting my contrary will to His—the obey part. It’s difficult to trust God when chronic concerns drag on for years with no apparent answers to prayer. It’s difficult to trust God when things happen that demonstrate no discernible good. It’s difficult to trust God when life is turned upside down and the future looks hopeless. It’s difficult to trust God through a fog of pain and fatigue. Yet, it’s at these very times that we must learn to confess our continued trust. And we need to submit our wills to His in humble obedience. These aren’t easy lessons. And they aren’t easily learned. In fact, I must be a slow learner because they are lessons God keeps teaching me. But I take comfort from knowing that the “heroes of faith” in Hebrews 11 didn’t posses any extraordinary gifts or strengths. They were ordinary believers, sharing many of my faults and weaknesses, who are listed as examples of faith because they simply trusted God and obeyed Him. That “roll call of faith” serves as a reminder that we demonstrate our trust in God when we obey Him, even when it isn’t easy. The above is a slighty edited version of an essay by Glenda Mathes that appeared in the February 2007 issue of The Outlook and was one of the winning entries in its essay contest that year. i have said for a few years now (only 8 years ago becoming Reformed) that we have to be very discerning of all lyrics we sing whether as adults or most certainly at the impressionable period of childhood. thanks Glenda. You nailed it again. Thanks for reading and commenting, Nancy. Thanks especially for your encouragement!